Last year many of you enjoyed our performances—top-notch singing, unsurpassed venues, great food, and popular prices. Our goal is to please you and thank you for supporting a premium brand of classical singing in Washington. We are most proud of the artists we bring to our stages. What other “smaller” company can boast of presenting top-notch singers from the Met, Covent Garden, and other famous opera houses of the world? Under the Gracious Patronage of H. E. Stanislav Vidovič, Ambassador of the Republic of Slovenia, enjoy our cavalcade of stars as we open the season with our spring concert presenting many of our leading singers— Fairouz Foty, Jesús Daniel Hernández, Gustavo Ahualli, Elizabeth Treat , and Anamer Castrello with Maestro José Antonio Espinal conducting the Washington Opera Society String Quartet. Slovenian Embassy. Cocktails ~ 6:30 PM, Dinner with Wine ~ 7 PM, Performance ~ 8 PM. Reserved Seats: $125. 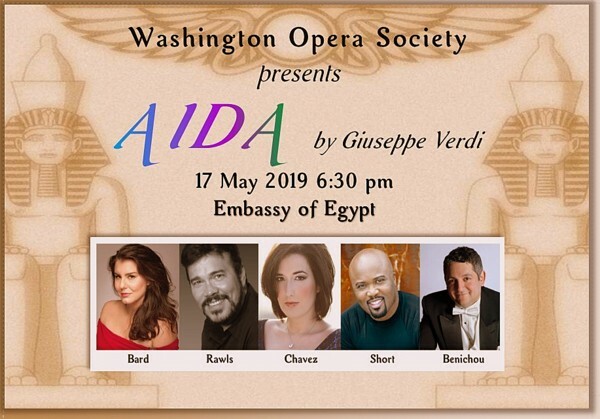 Under the Gracious Patronage of H. E. Yasser Reda , Ambassador of the Arab Republic of Egypt & Mrs. Nahla Reda, The Washington Opera Society proudly presents Aida by Giuseppe Verdi . Set in Egypt during the reign of the pharaohs and first performed in the Khedivial Opera House in Cairo on December 24, 1871, our Production will featuring an all-star cast of leading singers from the Met and other leading opera houses of the world— Rochelle Bard, Arnold Rawls, Lisa Chavez , and Kevin Short, with soaring choruses and full orchestra conducted by Maestro Julien Benichou . The Embassy of the Arab Republic of Egypt 3521 International Ct. NW. 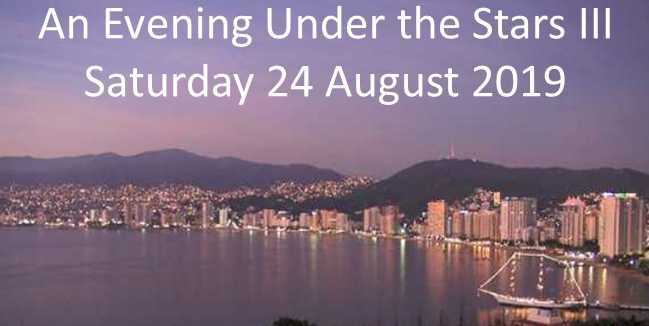 Reception ~ 6:30 PM, Dinner Provided by Award-Winning Embassy Chef ~ 7 PM, Performance ~ 8 PM. Reserved Box Seats $250, Front Seats Reserved: $125, Middle Unreserved: $75, Rear Unreserved: $50. Enjoy the waning days of summer in the Garden of the Executive Director, Michael Reilly . This fanciful summer event, back by popular demand, will feature an elegant outdoor show, great food, and good friends. Consider becoming a major donor and receive your VIP Invitation as our special guest! Considered by many to be one of Verdi’s grandest operas, and one which is rarely done in Washington. 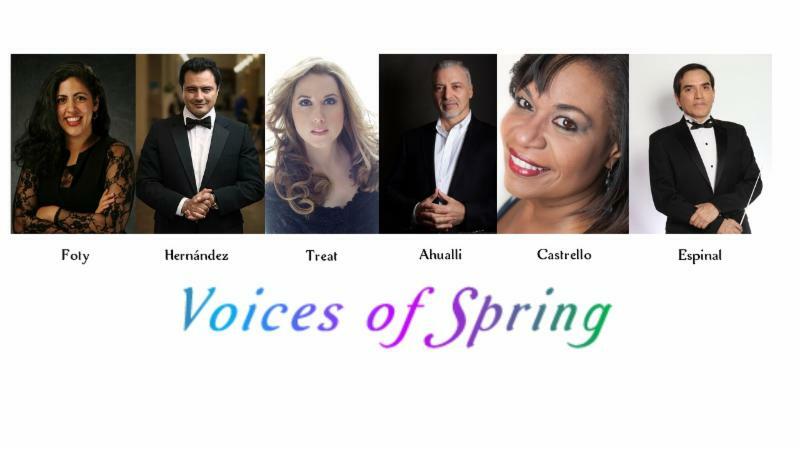 This Production will feature Spanish tenor Israel Lozano as lead tenor Manrico and Egyptian soprano Fairouz Foty in her interpretation of Leonora , a lady of nobility, and Anamer Castrello , our leading mezzo-soprano in her role as Azucena. This Production will continue to set the Washington Opera Society apart as it embarks on a new challenge with towering music, duets, ensembles, and thrilling choruses. Dinner included. Venue to be announced. This operetta is one of the most beautiful and rarely produced in the repertoire. Another Washington premiere! Your hearts will melt as forbidden love goes awry with unforgettable melodies and lots of romance as Chinese Prince Su-Chong entices and overwhelms our Austrian Countess, Lisa. Chorus, and orchestra conducted by Maestro Julien Benichou . German Dinner included. Venue to be announced. Click Here to Purchase Tickets for Current Season 2019 on InstantSeats. On the evening of December 7, 2918, under the patronage of Ambassador, H.E. Javlon Vakhabov , WOS produced Die Csárdásfürstin (the Gypsy Princess) at the historic mansion of the Embassy of Uzbekistan. The operetta by Hungarian composer Emmerich Kálmán premiered in Vienna at the Johann Strauss-Theater on November 17, 1915. Widely beloved across Europe, this production in Washington, DC was a rare occurrence, making the night a special treat for the area’s opera lovers. The charming story—a scandalous one at the time of its original production—explores the love affair between an aristocratic gentleman and a sultry cabaret singer around the time World War I was raging and Europe was in turmoil. With Maestro Julien Benichou conducting and Maestro Scott Beard narrating, the audience was transcended to Budapest and Vienna as if they were hearing and seeing the original cabaret troupe. Once again WOS presented young and up-and-coming singers with seasoned professionals. The evening starred Suzanne Karpov , hailed by the San Francisco Chronicle for her “elegant” soprano, both “incisive and tender,” Peter Joshua Burroughs , critically acclaimed as a commanding singing actor; Joanna Jones , making her WOS singing debut; Jack French , a first year student in the Maryland Opera Studio; and Brandon Shaw McKnight , a classically trained singer and actor. 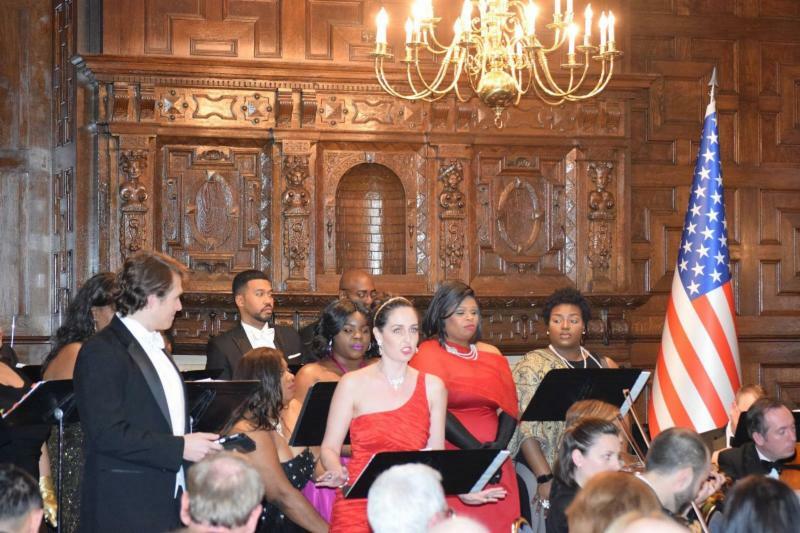 With the Carter Legacy Singers and the ladies and gentleman of the orchestra, the musicians uplifted the evening’s audience. Prior to the concert, patrons enjoyed an exquisite dinner service provided by the Embassy chef along with wines and desserts and walked amongst the beautiful Uzbek décor in the Embassy building that displays many of the rich traditions of Central Asian arts such as woodcarving, silk weaving, glass staining, and paintings. For many in the nation’s capital, Washington Opera Society’s production of Die Csárdásfürstin was an unforgettable experience and a perfect way to usher in the holiday season. The Washington Opera Society will demonstrate our love and concern for our community by appearing pro-bono on behalf of the McLean Community Village Association on Sunday afternoon April 7 th at 2 PM at the Alden Theatre in McLean, Virginia. Our Company will present our Cavalcade of Super Stars in a loving tribute to as many as 350 seniors and others. The MCVA is a non-profit primarily serving the needs of seniors in Northern Virginia. The Board of Directors held its annual meeting in December of 2018 at the home of Michael Reilly , Founder and Executive Director. The end of year get-togethers are usually a mix of business and pleasure as we face the prospect of another year passing before us. Among the main issues facing the Company are how to remain relevant, how to reach out to younger and new patrons, and how our ability to raise capital for these undertakings will affect us. Other questions revolve around what to produce to keep the Company in the spotlight, what the best venues are, and how to attract the most important singers in the world. These lofty business and artistic questions must be solved by our dynamic team of individuals who are well schooled in the areas of finance, administration, fundraising, and arts productions. Our President in 2018, Alex Lok , will now serve on the Advisory Council. Alex has been a cornerstone in the Company and has many credits to his name in only one short term. His international experience at the World Bank opened countless doors. We are fortunate that his innovative spirit will continue to be an asset for the Company. Replacing Alex as Board President for the 2019 term is Viennese-raised Siegfried Zottel, a World Bank expert specializing in areas of financial inclusion, digital financial services, and behavioral finance to improve the lives of those living in poverty. Siegfried has already been hard at work steering the Washington Opera Society into safe harbors with his infinite passion for the arts and opera, interest in outreach to young and marginalized people, and leadership skills. We welcome Siegfried and wish him every success! We are extremely pleased that Anne L. Howard-Tristani , who has served with excellence on the Advisory Council, has become a Member of the Board. Anne, who is President of Howard-Tristani International Consulting, is a member of the boards of various other celebrated institutions and organizations, including the Embassy Series and the Smithsonian Institution’s National Museum of African Art. We look forward to benefiting from her business acumen, passion for the arts, and philanthropic experience now as a Member of the Board. Adding another stellar addition to the Board, we welcome Baroness Alexandra Sényi de Nagy-Unyon, a native of Vienna, Austria. She is a foreign law advisor at Elliot & Mayock LLP and several other law firms and is affiliated with Washington social, cultural, political, and arts organizations. She has been deeply involved with the Georgetown Lombardi Comprehensive Cancer Center and currently serves as its Benefit Committee Co-chair. With her passion for opera and her experiences in fundraising and philanthropic causes, Alexandra is well suited for the WOS Board. We are thrilled and honored to welcome Ms. Jan Du Plain to our Advisory Council. Jan is an icon in the Washington international scene with her extensive work with the embassies and in her role as President and CEO of Du Plain Global Enterprises, Inc. Jan began her career at her father’s award-winning weekly newspaper in California followed by a stint at a well-known literary agency in Hollywood, representing authors, screenwriters and actors for motion picture companies. Jan specializes in public relations, embassy special events, diplomatic public relations, international fundraising, and marketing in Washington DC and globally. Dr. Joseph DiGangi , Former Professor Emeritus, retired from Hobart and William Smith Colleges who has also joined the Board of Directors, is a board member of the Arena Stage and the Kennedy Center and a lover and patron of the opera and the arts in general. Having had a long career as a college professor he is now ready to apply his many skills to making the Washington Opera Society a household name. By working with local colleges and universities, he will be bringing greater awareness of opera to young people. His love and knowledge of opera and his experience within the arts community will be a huge asset to us. We are very proud to welcome to our Board of Directors our newly elected Vice President, Leila Mol Beale , wife of the former Ambassador of Barbados and a well-known socialite in the Washington, DC arts circles. Born in Brazil and now living in Washington with her husband, Leila will be working hard to bring attention to the Washington Opera Society within the diplomatic community and elsewhere. Adding to our roster of superstars is Ms. Anne-Marie Tighe. Anne-Marie is a former scientist with the federal government and is very well known in the arts community of Washington as a patron and supporter. We are very proud of our new team and extend our best wishes for much success! We loved bringing you a great season of stirring music and great artistry in 2018. As you saw and heard last season and will experience again in 2019, WOS is focused on the music and the singing. We know that without your help there would be no Washington Opera Society . Our ambitious schedule for 2019 requires your help even as we reach out to the Washington, DC Government and private foundations for support. Over the coming season, WOS will be supporting the Washington area community by inviting young people at little or no charge to our performances, organizing a scholarship program for students of voice at local universities, and, and hosting the finest talents in the opera world alongside up and coming young artists.